Not a particularly masculine pair of words, I'm sure you'll agree. However, my latest creation involves something akin to "building", so I guess I can reclaim a modicum of manliness there. 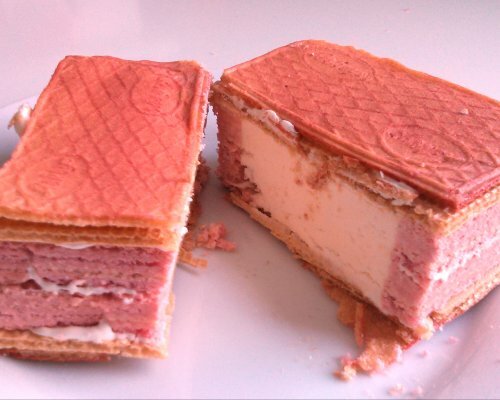 The plan was to create a sort of giant pink wafer, with vanilla ice cream in the middle. 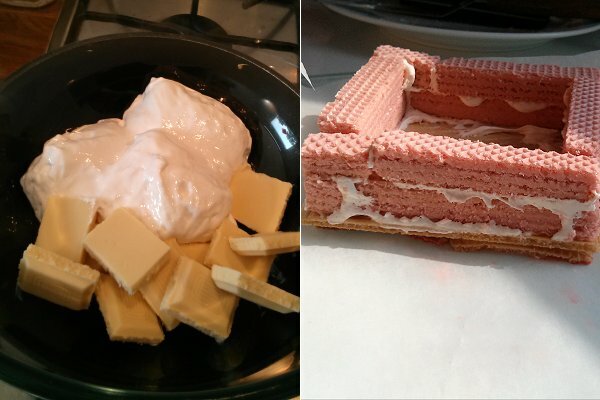 Side walls built out of actual pink wafer biscuits, and the top and bottom out of rectangular ice cream wafers. 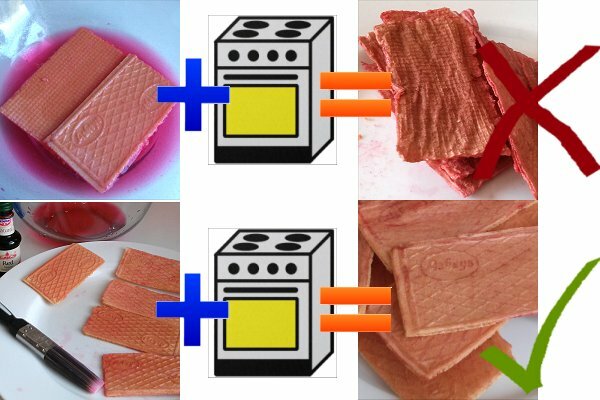 The first thing to figure out was how to dye the large wafers pink, to create the top and bottom layers of the wafer sandwich. My first idea was to soak them in a solution of red food colouring, then dry them out in the oven. However, they emerged from the oven rather crinkly and deformed - this technique was clearly not going to work. The second approach involved "painting" them with a stronger solution, followed by a brief blast in the oven. Although not the perfect colour, at least I now had something I could work with. 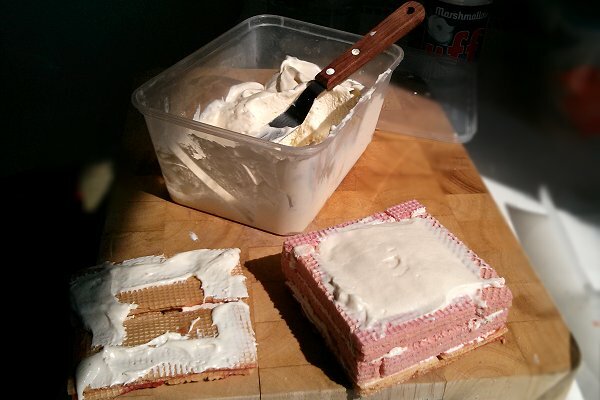 Now it was time to build the wafer construction which would house the ice cream. 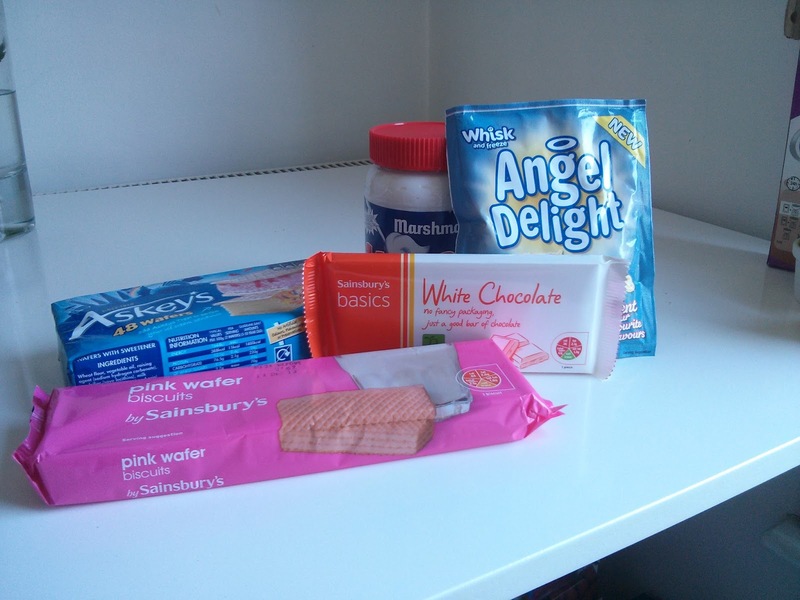 I cut the pink wafers in half lengthways, to create thin strips to use for the walls. Then, casting my memory back to an earlier creation, I remembered that melted chocolate and marshmallow fluff was possibly the stickiest substance known to man... this would be a perfect glue for sticking all these wafers together! I filled the structure to the brim with almost-frozen ice cream, and then stuck on the wafer "lid" with more of the gluey mixture. After tidying up the surplus glue which had started to ooze out, I put the whole thing in the freezer, and after a couple of hours it was ready to eat! It was the perfect size to cut in half and share with someone special. But I ate it all myself. 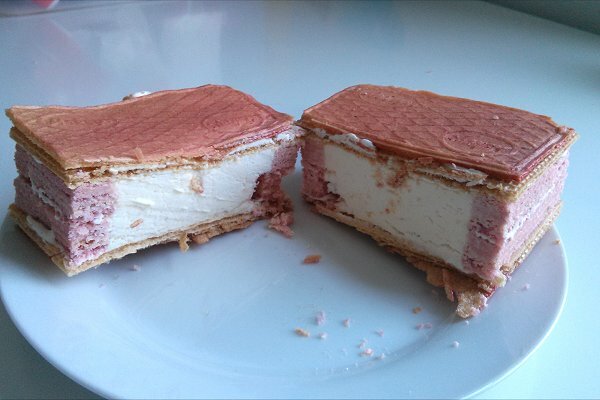 The sunny weather may be coming to and end, but there's never a bad time for ice cream. Retro Biscuit Ice Cream #4 - "Viscount"
Retro Biscuit Ice Cream #3 - "Orange Club"